Florin’s Glendale Gallery will showcase exhibition of original paintings, prints and beautiful gifts and stationery by renowned Northumberland Artist, Mary Ann Rogers. Mary Ann Rogers’ artwork is sought after across the length and breadth of the country and this exhibition is her first solo exhibition in the Wooler area. Mary Ann Rogers is an award-winning Northumberland Artist, and one of the UK’s 'Best-Selling Published Artists'. 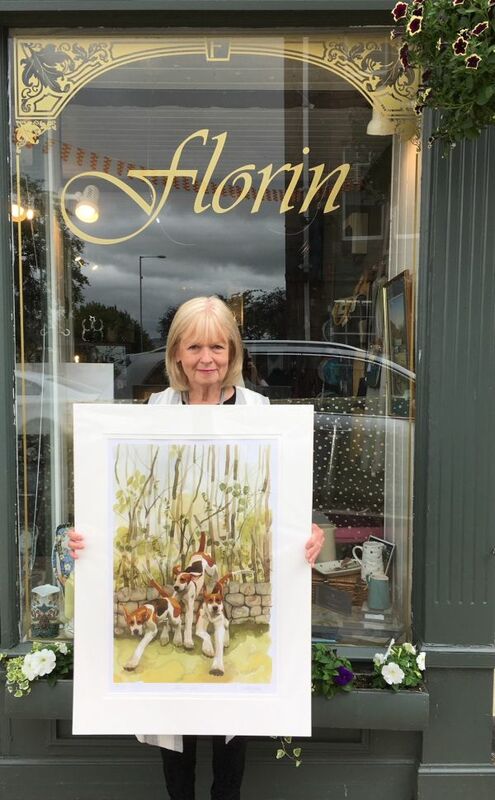 Florin, on Wooler’s High Street, has sold Mary Ann Rogers prints for many years, and this is the first time that they have held a solo exhibition. Taking place from Tuesday 21st August for two weeks, it will feature original paintings, prints and gifts including landscapes synonymous with Northumberland, hares, chickens, and Swaledale sheep. Glendale Gallery will host a private viewing of the artwork, when guests are invited to meet Mary Ann on Monday 20th August 2018, 6-8pm. Ahead of the exhibition, Mary Ann commented: “I’m really pleased to be invited to exhibit my paintings at Glendale Gallery this August. Sheila has long been a supporter of my work, and stocks prints, cards and other gift items in her lovely shop throughout the year. There will be a range of limited edition prints available, as well as cards, 2019 calendars and diaries and other quirky gift ideas featuring the landscape and wildlife of Northumberland, which make perfect mementos for visitors to the area. Giving background to the exhibition, Sheila Tennet, owner of Florin said: “We are absolutely delighted to present this one–off exhibition, which I know will be very popular with both regular customers and new visitors. Mary Ann Rogers is one of the most creative and vivacious ladies I have ever met, and we have stocked her paintings and other items for many years. The exhibition, located in the Glendale Gallery to the rear of Florin, located at number 3 High Street, Wooler will be open 10.00am to 5.00pm Monday to Saturday and 10.00am to 4.00pm on Sundays. Visitors are welcome to come and view the exhibition within these times from 21st August – 4th September 2018. Florin of Wooler can be contacted on 01668 283700.